Fluorescence microscopy is a technique for acquiring microscopic images of samples (often biological materials) using fluorescence within the sample, which is usually excited with a sharply focused diffraction-limited laser beam. The focus of the laser beam is raster scanned through the sample (e.g. using galvo mirrors), and the fluorescent light excited in the sample is collected with some optics and monitored with a photodetector. Residual laser light can be eliminated with an optical filter before the detector. The fluorescence microscope is usually operated with a computer (a PC or a laptop), which controls the scan, records the fluorescence intensities, and finally generates, processes and stores the obtained images. Such devices are widely used in biomedical imaging, for example. Figure 1: Setup of a confocal fluorescence microscope. 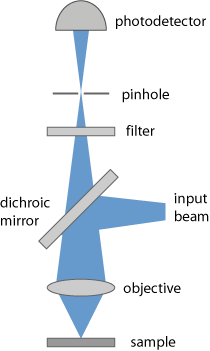 It is common to use a confocal geometry (Figure 1) (→ confocal scanning microscopes), where the light from the focus in the sample is imaged onto a pinhole, which therefore suppresses light coming from other regions (e.g. from before the focus). This allows the use of relatively thick samples, compared with conventional microscopy, and results in a high depth resolution. For optimal performance, it is essential that the used microscope objective has appropriate achromatic properties, so that the fluorescence slide has the correct focus position at the pinhole. The fluorescence can originate from molecules which occur naturally in the sample, or from dye molecules which are introduced during sample preparation. The image contrast can arise from varying concentrations on the fluorescent molecules, or from influences on these molecules which e.g. modify their fluorescent lifetime (see below). The requirements on the used optical filter can be demanding, since the generated fluorescence light may be rather faint compared with the intense laser light, and the wavelength separation is often not very large. In the simplest form of fluorescence microscopy, the laser is operated continuously, and its wavelength is chosen to be in an absorbing spectral region of the fluorescent molecules, which can therefore be excited with single-photon absorption. Due to its nonlinear nature, the absorption is much more concentrated in the beam focus, so that the resolution in both the lateral and axial directions is increased. For the same reason, the laser beam can penetrate larger layers of transparent material, i.e., thicker samples can be used. Also, photobleaching effects are minimized by concentrating the excitation to the “useful” region only. For the infrared wavelengths used, scattering and absorption e.g. in biological samples is typically much weaker. As the excited fluorescence is naturally concentrated in the focus, it is not really necessary to use confocal detection (see above); elimination of the pinhole increases the detection efficiency. In some cases, the fluorescence is even detected on the side, rather than in the direction of the laser beam or opposite to it. Time-gated detection allows the monitoring of the fluorescence intensities in certain time intervals after the exciting pulses. This makes it possible to measure the local fluorescence lifetime, which can also be used to obtain a good image contrast. This technique is called FLIM = fluorescence lifetime imaging microscopy. A variation is FRET = fluorescence resonant energy transfer, where energy transfer from excited molecules to other molecules in the sample is utilized. Other related techniques utilize wavelength-tunable lasers to obtain additional information e.g. by tuning to absorption wavelengths of different fluorescent molecules. 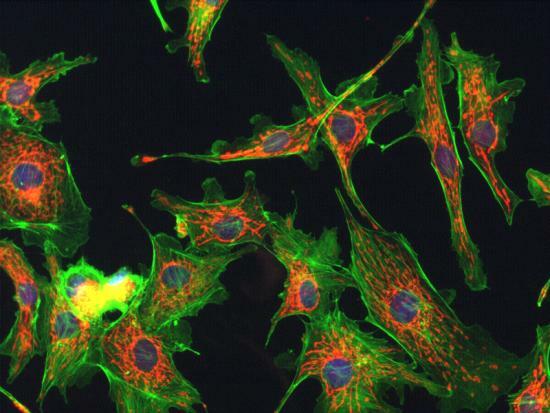 Figure 2: Fluorescence microscopy image of cells, acquired at the Integrated Microscopy Facility, University of California, Santa Barbara and kindly provided by Dr. Kalju Kahn. Note that the wavelength difference between laser light and fluorescence light is particularly large for multi-photon excitation. This makes the design of the filter less demanding. On the other hand, the microscope objective needs to be specially designed not only for high transmissivity for all involved wavelengths, but also for rather similar values of the focal length despite the large wavelength difference. Another variant of fluorescence microscopy is stimulated emission depletion microscopy (STED microscopy) [2–4, 12]. Here, the fluorescence marker substance is first excited with a Gaussian-shaped pump pulse. Shortly thereafter, a second pulse with a doughnut (donut) shape (having zero intensity at the center) is sent to the same spot. The second pulse has a slightly longer wavelength, and as a consequence it mainly causes stimulated emission, which depletes the excited region preferentially in a ring around the center of the original spot. As a result, a smaller excited region remains, and this can be exploited to achieve a significantly higher spatial resolution of below 100 nm, sometimes even below 20 nm. This resolution is substantially better than is normally possible for optical microscopy (apart from near-field microscopy), i.e., Abbe's resolution limit is broken. In 2014, the Nobel Prize in Chemistry  was awarded to Eric Betzig, Stefan W. Hell and William E. Moerner “for the development of super-resolved fluorescence microscopy”. Whereas Stefan W. Hell had developed STED microscopy, Eric Betzig and William E. Moerner pioneered another method named single-molecule microscopy, which also allows the creation of super-resolution images. It was recognized by the prize that the long-standing resolution limit according to calculations of Ernst Abbe can finally be surpassed; one may now even use the term nanoscopy instead of microscopy for these imaging methods, as structures on a length scale far below a micrometer (thus in the nanometer regime) have become accessible. This substantially widens the field of applications of light microscopy. It may be somewhat surprising that advances which clearly lie in the field of physics have become the basis for a Nobel Prize in chemistry, but Stefan Hell's essential work was actually done at the Max Planck Institute for Biophysical Chemistry in Göttingen, and some important applications lie in the fields of chemistry and biology. A single image taken with that method only reveals only certain locations, the positions of some fluorophores. A full image of the sample can be obtained by combining multiple images, where different sets of the fluorophores are activated. Activation and deactivation of the fluorophores occurs by the influence of the scanning laser beam, because the fluorophores can be switched between a fluorescent state and a “dark” state. As mentioned above, fluorescence microscopy is mostly used for biological samples, e.g. for medical diagnosis. It is currently investigated in which form fluorescence microscopy can be used e.g. for the detection of cancer. It is also useful for imaging living cells. Particularly with multiphoton fluorescence microscopy, it is possible, e.g., to watch cell division without severely influencing the cells, whereas cells often cannot tolerate single-photon excitation for extended time intervals.